This rustic wooden box sign - with its old-school, stencil-style lettering, stylishly faded paint and realistic weathering - looks fantastic on any wall, mantle, shelf or practically anywhere you place it, and, best of all, it expresses an important, earnest message to all who see it. “Home of the Free, Because of the Brave,” it reads. What a heartfelt, inspired tribute to the brave men and women who place their very lives on the line protecting our freedom! The off-white, weathered stencil letters are emblazoned on a background of tastefully faded red; the red, white and blue stars and stripes of “Old Glory” – also gracefully worn – encircle the box’s back and sides. At 4”, there’s really no wrong place to put this handsome piece of vintage-style décor. It livens and adds a touch of traditional rural grace to any living room, bedroom, kitchen, dining room, den, office, garage, barn – the list goes on. Get two – one for your own home, one to gift to a veteran or active-duty serviceman/woman in your life. Thankfully, it’s easy and painless with our unbeatable prices! 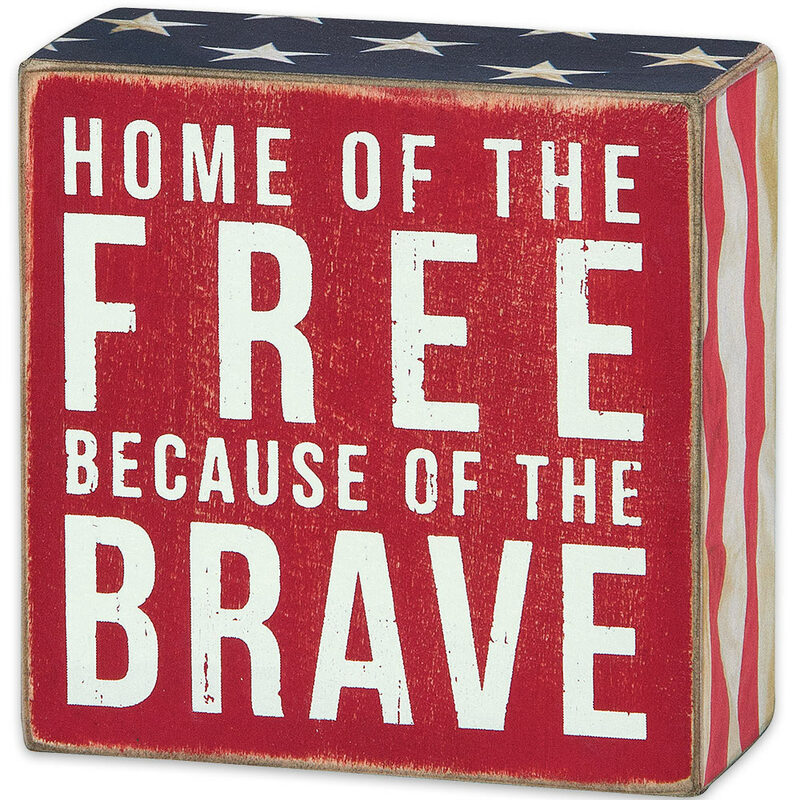 Glance at this stately, eye-catching box sign every time you walk past it, and remember the sacrifice so many have made for your freedom.